I read this article and thought it was brilliant, thought it might be something for you. 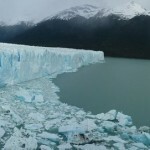 The article is called Perito Moreno Glacier, El Calafate and is located at https://timeasatraveller.com/perito-moreno-glacier-el-calafate/. A three and a half hour bus ride south from El Chalten is a town called El Calafate, about 5 times the size of El Chalten and home to Perito Moreno Glacier. As it turns out, every tourist within a 500km radius had also decided to head to El Calafate, so it was Goodbye sacred quiet of the Patagonian mountains. The hostel we checked into was brilliant. I used to have a preference for checking into the smaller hostels rather than the bigger ones. Friendlier, cosier, and putting money into the small local businesses. Until we found everything we owned was infested with bedbugs from one such hostel. So it was time to go for the biggest chain hostel we could find. Che Lagarto in El Calafate was just that place. It was beautiful, like actually beautiful. Lobby area, a bar, Wi-Fi accessible everywhere, new bunk beds, shiny bathrooms, and staff with matching T-shirts. Hello new home. The first thing we did was to wash all our clothes, spray everything else with the heavy duty insect spray and put it all out in the sun. Luckily we had a room with a balcony. It seemed to work a treat. Later that evening I was sitting in the lobby and who happens to walk in, Yann and JB. Small world. So we took the opportunity to organise heading out to the Glacier together in the morning. I giggled to myself as I noticed that when speaking together in French, Yann calls JB ‘Jibi’. Often with a sentence starting “Woh Jibi…” which is kinda cute coming from a grown man with a ginger beard. Perito Moreno Glacier is best seen first thing in the morning, for both the view and the price. The tourist buses don’t arrive until 9.30 and the office opens at 8am, so if you beat it you don’t pay the extortionate 60 Pesos entry fee and you get the glacier all to yourself. We jumped in a cab at 6am and made it there for 7.30. Free entry and only the odd Israeli in sight. The glacier was spectacular. 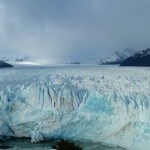 Perito Moreno Glacier is located in Los Glaciers national park and is apparently the only glacier in the world in a state of equilibrium, it is neither advancing or receding. It has an average height of 74 meters above the waters surface, a total ice depth of 170 meters, and is the worlds third largest reserve of fresh water. There is a spectacular roaring sound when ever a segment of ice breaks off. It’s absolutely stunning. So we jumped over a few fences and took some amazing photos. On the way back to town our cab driver drove past the payment booth, parked the car, got out and called one of the guys over to charge us for entry that we thought we had craftily bypassed by going early. The rest of the ride back to town he gave us a spiel about how all tourists must pay and us ‘travellers’ were no exception. Extortionate fees for natural beauty, yes, but right he was (excuse the yoda speak). This is the way it is for natural beauty the world over (Ireland is a great example of that), and Argentina is no different. For future reference, those wanting to avert the fee may want to opt for a hire car. From El Calafate we said our goodbyes to Yann and JB again (although it never really seems to be good bye with these guys) and headed a further 5 hours south and back over the Chilean border to Puerto Natales. The starting point for Torres del Paine national park.